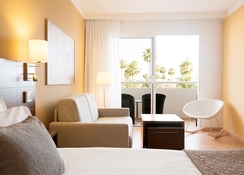 Sunprime Atlantic View Suites & Spa is a 4-star complex situated centrally in Playa del Ingles between the beautiful green gardens of Island Paradise in Gran Canaria. This adults-only hotel is about 2.2 km away from the famous beach of Playa del Ingles and 1 km away from the shopping centre Yumbo centrum. 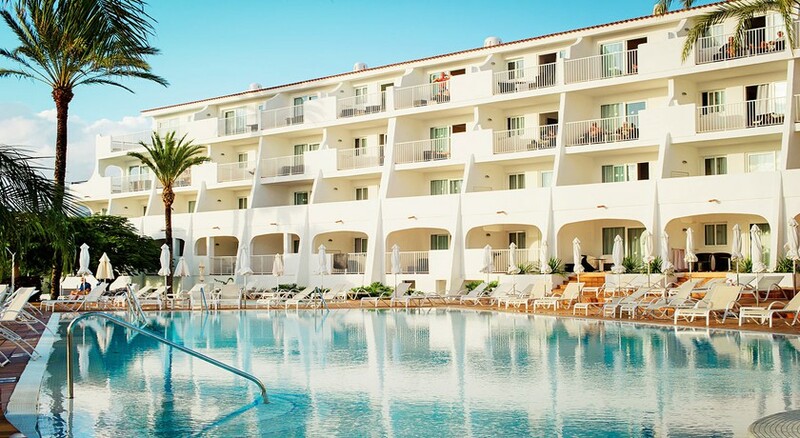 The hotel Sunprime Atlantic features 3 large swimming pools with plenty of sun beds to relax at any time of the day. Various activities such as yoga, Pilates, aerobics, aqua fit, etc. are held by the pool. The 229 guestrooms at the hotel are air-conditioned and well-equipped with all room facilities. Guests can enjoy playing beach volleyball at the nearby beach of Playa del Ingles. Due to its location, the hotel has access to many shops, restaurants, bars, and shopping centres. Guests can also go sight-seeing and explore other areas of the Island by using the local bus service. The bus stop is adjacent to the hotel. 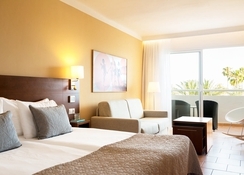 The hotel is located near the beach of Playa del Ingles in the Paradise Island in Gran Canaria. The beach is 2 km away from the hotel and can be visited through a free shuttle service offered by the hotel. The town centre is about at 2 km from the hotel. The Gran Canaria Airport is 20 km away from the hotel. The hotel is 1 km from the Yumbo Centrum and 300 metres to the nearest restaurant and bar. The Maspalomas Golf Club is about 1 km from the hotel property. The hotel offers 229 spacious guestrooms, all elegantly decorated and equipped with all essentials. 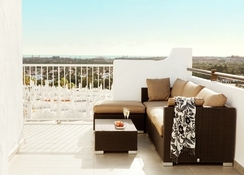 The rooms are categorised as one bedroom apartments and studios. One bedroom apartments have a separate bedroom with twin beds and one sofa bed in the living area, suitable for a maximum 3 people. The studios also have twin beds and a sofa bed, can accommodate 3 people. All rooms have central air-conditioning, heating facility, bathrooms/WC, shower/bath and a hairdryer, a well-equipped kitchenette with a mini-fridge, cooker, microwave, and tea & coffee amenities. Other room facilities include ironing set, internet access (with charge), radio, satellite TV, safe hire and a balcony or terrace with views. A variety of best cuisines are served at the Prime Kitchen restaurant for breakfast, lunch, and dinner. 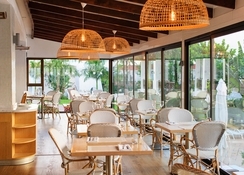 The all-inclusive package offers buffet breakfast, lunch, dinner, light snacks, afternoon tea, and ice-cream. 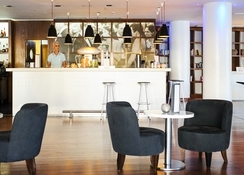 Local alcoholic, non-alcoholic, and soft drinks are served at the hotel’s bars. Entertainment shows can be enjoyed during dinner. Sunprime Atlantic View Suites & Spa features 3 swimming pools with sun terraces, loungers, and parasols, offering a good opportunity to relax under the sun. Pools are heated during winters. Activities such as aqua fit, yoga, aerobics and Pilates are arranged for guests. The wellness centre at the hotel offers a gym, sauna, massage, beauty treatments, and spa treatments. Also, guests can take the free shuttle service to the nearby beach to play volleyball and relax on the sun loungers and umbrellas (local charge).